Last week, I was invited to visit Ingolstadt Village for their “Denim & Blue Weeks”. In collaboration with their lovely team I put together four different looks which we then shot around the many shops of the designer outlet. First outfit from the photo above: cool black hat that I found in the Levi´s store, which is where I also got the denim jacket and the white T-shirt from. The trousers are by Pepe Jeans, shoes by Converse – all in all a casual denim look with a little twist. Boyfriend dress, which is basically an oversized shirt, by Levi´s. In combination with the colours of the checked jacket (also by Levi´s) and the brown wedges by ASH this outfit really sets the mood for early autumn. He’s wearing a Beanie by Closed, a grey Levi´s T-shirt with a deep crew neck, a checked shirt and baggy jeans also by Levi´s, Converse shoes. A look inspired by the skateboard scene. 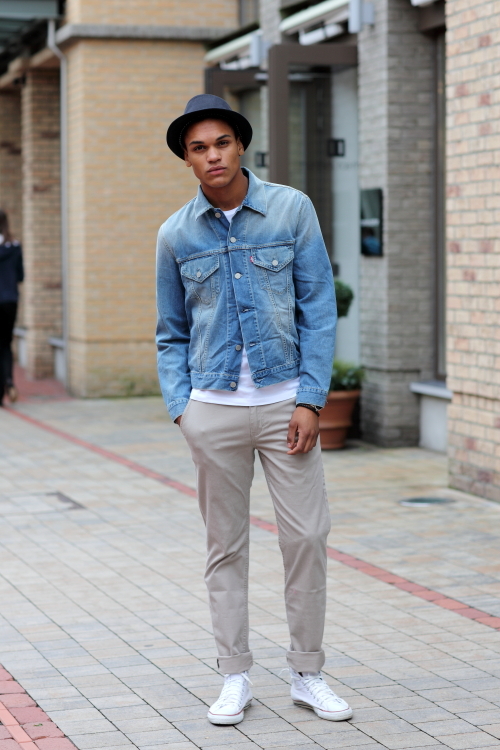 Look number 4: beanie by Closed, grey skinny fit jeans by Pepe Jeans, a shirt made of dark denim and a loose fit tanktop, both Levi´s. Together with the Converse Chucks this look seems rather cool and casual, worn with high heels it would be a more elegant alternative.